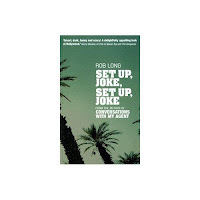 In possibly the least catchily-titled book ever, Rob Long brings us another volume of What It's Really Like to Write for Television. Apparently what it's really like is a lot of sitting around, either worrying or thinking of stuff to write, or listening to other people's problems, or listening to network people give you notes, or trying to interpret fruit baskets that have come from the network. If you read his very funny Conversations With My Agent, you will already know what this book is about, more or less. This time, however, it seems a little different. Everyone in his cohort is a little older and they're starting to get pushed out by younger people, even the writers. Everyone has a little less job security than they used to. The shows get lower ratings, they have less of a chance to make it before they get pulled, and everyone just seems to have a narrower window of opportunity and a greater air of desperation as a result. It's interesting that this is his perception of things, because he is, essentially, a bit of an outsider who, if IMDB is correct, hasn't had a show on the air since 2001. So of course he would feel out of touch and wary. I'd be interested to read something from the point of view of someone who is actually working, but of course, they don't have time to write about what they're doing, they just have time to write.